If this is your first visit to my blog, welcome! 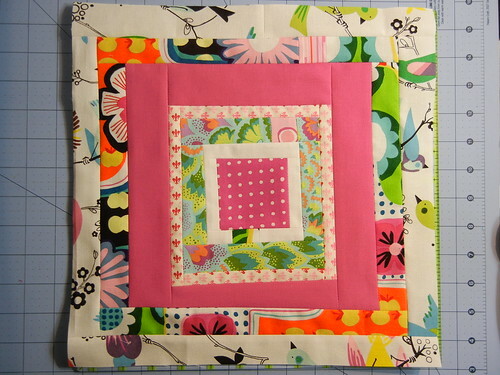 I'm super excited to participate in Bloggers' Quilt Festival, the spring edition, hosted by Amy's Creative Side today. If you've never participated before, you simply must visit the Festival. It's a veritable treasure trove of quilty inspiration! The quilts range from monochromatic to bursting with color, from traditional to modern to art quilts, from beginners to experts, and it's a ton of fun to participate in. 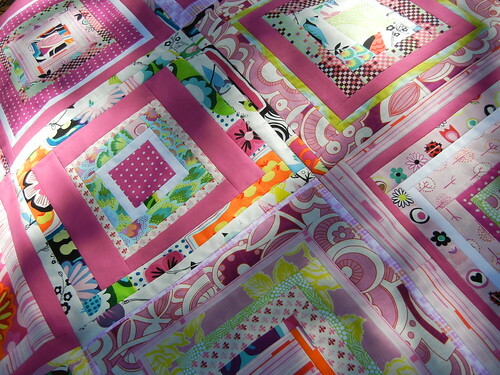 I'm featuring my first charity quilt today for Bloggers' Quilt Festival. Last year, when I first began quilting and reading quilty blogs, I saw lots of mentions of Margaret's Hope Chest, and after a while, I finally followed some links to read more about the charity. They have given over 1,000 quilts away to needy children and families and accept unquilted quilt tops, quilt blocks, and completed quilts. Their Wrapped in Hope program appealed to me most, a program where quilters can sign up to make a birthday quilt for a child with a parent in prison. I picked Kayla, who would be turning 18 in April. The fact that she was turning 18 was what drew me to her - I thought to myself, here is a young woman beginning her journey into adulthood, without her father present in her life. I wanted to make something for her that would not only warm her on a cold night, but that would maybe fill her home with hope and love. I started with the information provided by her mother, that Kayla loved the color pink and ballet. After failing to find a single ballet-centered fabric that felt like it was for a child over the age of 8, I decided to stick with the color pink. 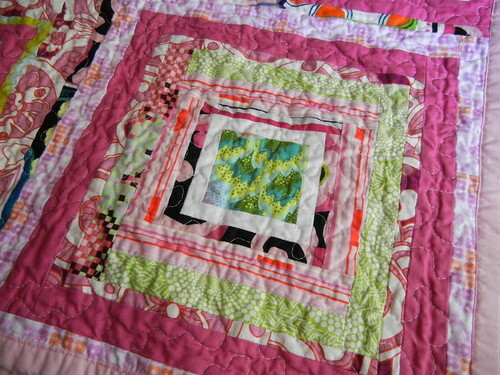 I added a few other colors, lime and aqua, to give the quilt a bit more depth, and began hunting for a pattern. One day, while cleaning house and organizing my stacks and stacks of magazines, I came upon my seriously large stack of Martha Stewart Living magazines and remembered a quilt I saw in Martha Stewart Living a million years ago - a feature on Denyse Schmidt that showed off a one of her amazing quilts, Drunk Love in a Log Cabin. I remember thinking that quilting might just be kind of cool after seeing that quilt. I had Denyse's awesome book on my shelf, with has a variation on that pattern in it, but I decided to just wing it. I cut the fabric into strips of various sizes, and went to town putting the blocks together. I was working at the same time on my Single Girl quilt, and the freedom of randomly piecing these blocks together after the tediousness of the Single Girl pattern was a much needed release. I wasn't sure at first how I wanted to put the blocks together - if I wanted to sash them to break them up a bit, or if I wanted to just put them all together. I put the blocks up on my design wall with some space between them to simulate sashing, and I just wasn't happy with it, so I skipped the sashing. For the quilting, I stuck with my old stand-by, a meandering stipple, in white thread. 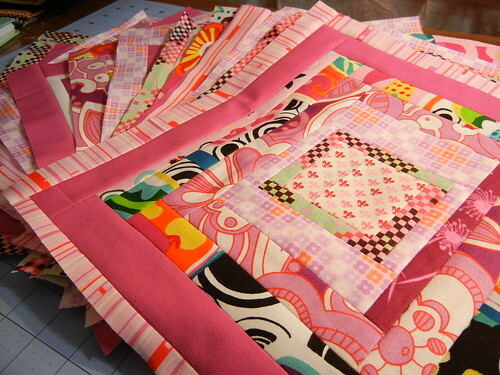 I like how it looks with this quilt, how it doesn't distract from the overall design of the blocks, but a small part of me wishes I had tried to outline quilt all of the blocks. 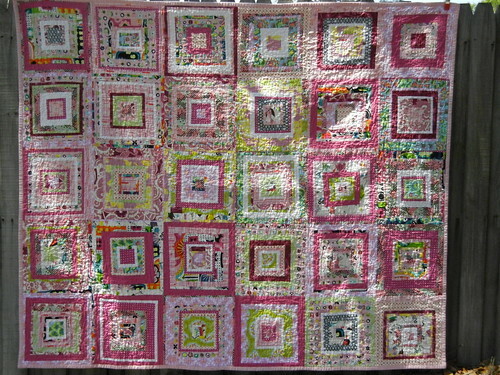 Maybe next time I make a quilt like this, I'll give it a try. Margaret's Hope Chest's Wrapped in Love program is all filled up for 2011, but if you want to get involved, they do accept unfinished quilt tops, quilt blocks, and fabric donations as well as finished quilts. For more information on MHC, visit their blog or website.